Mumbai, 25 January 2013: Whistling Woods - Neeta Lulla School of Fashion conducted a forum on ‘Future of Fashion’ to set a dialogue with fashion professionals from across the industry. Held at the WWI campus, the forum aimed at understanding the influence of global trends on Indian fashion as well as the use of new age technologies for fashion products and services. The panel included names like Lulu Raghvan, MD, Landor Associates, Rahul Narvekar, CEO, NDTV Ethnic Retail Ltd, Krsna Mehta, Founder & Design Director, India Circus Retail Pvt Ltd [indiacircus.com], Dhimaan Shah, Co-founder & Managing Director stylecracker.com, and Saket Dhanker, IMG- Relaince Fashion Head. They discussed how India is a lucrative market who can produce a global product and word class retail environment. The forum was spread across various categories to cover significant aspects of the Fashion Industry like the emergence of Luxury Brands in India and how the Indian economy has evoked a lot of interest globally given its statistics of some of the highest disposable incomes and increase in the number of millionaires. Also, growth of fashion retail provoked thoughts and saw a lot of excitement as the gen-next was keen to understand on how strategies can be adopted. 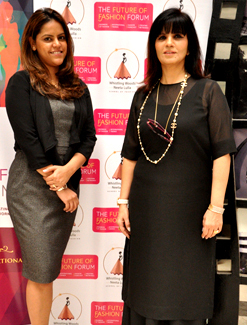 The forum was an initiative of the first batch of students from the fashion school. The day long forum additionally covered various topics concerning fashion trends & insights for AW 14/15, significance of e-commerce in promoting fashion, and influence of western silhouette in Indian hemisphere, which were enlightening for aspiring fashion students.